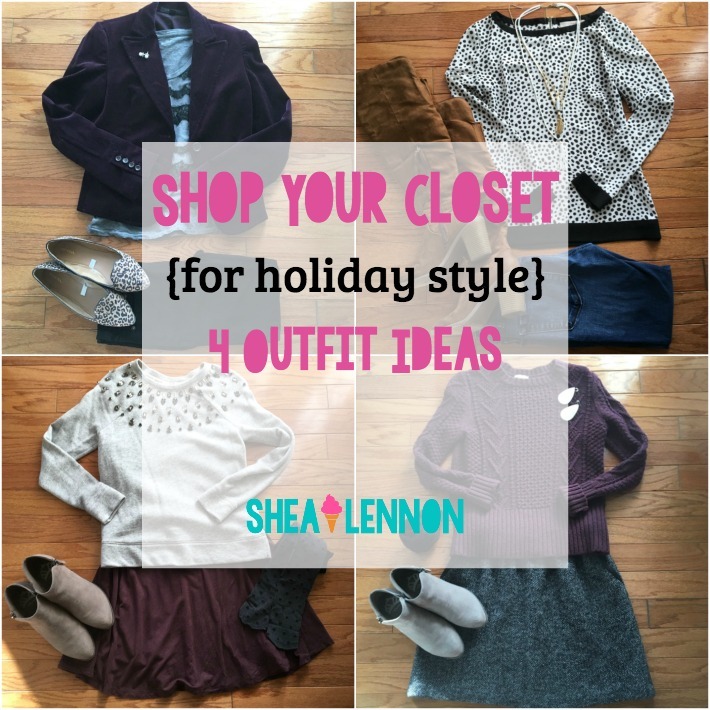 One of the recent prompts for our Live Your Best (Holiday) Life challenge for December was to shop your closet for holiday looks. I have to say that I had a ton of fun doing this on a Saturday morning when Jona was absorbed in Lego Avengers and Violet was napping. I put together four looks that still fit into my casual lifestyle, but feel a little more special and appropriate for holiday happenings. None of these would work for a formal Christmas soiree, but they might fit the bill for drinks with friends, a company party, or maybe Christmas Eve church service. Velvet is everywhere right now, so I'm so glad I held on to this velvet blazer that I thrifted years ago. It feels festive on it's own, but its "specialness" factor is increased when paired with this lace tee. Adding both velvet and lace makes an everyday look like jeans with a tee and a blazer feel a bit more glamorous for a casual holiday get-together. By the way, can you believe this entire look is second-hand? I hadn't planned that and was pleasantly surprised after I put this look together. 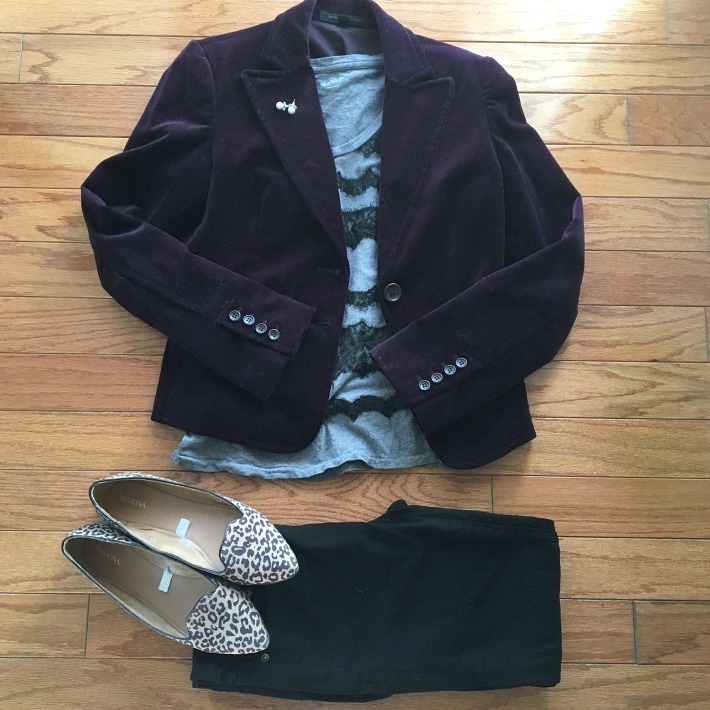 Shop your closet tip: look for unexpected textures to mix together. Other combinations to try include corduroy + silk, faux fur + leather, or flannel + satin. Just like in the first look, texture is so important in taking a look from everyday to holiday. I love this cable knit sweater with jeans, or this wool skirt with a simple button-up, but somehow the two together feels extra cozy. The rich color of the sweater, plus the thick, cozy fabric of both pieces, make this look feel just right for a holiday dinner or maybe Christmas Eve church. Shop your closet tip: now's the time to pull out your thickest knits and your coziest tweeds. Double up on the cozy, like I did here, by mixing thick nubby sweaters with wool or tweed, or, go the opposite route like in my first look and mix a heavier knit with a lighter fabric, like silk. I know over-the-knee boots are everywhere right now, but I still feel extra sassy when I wear mine. 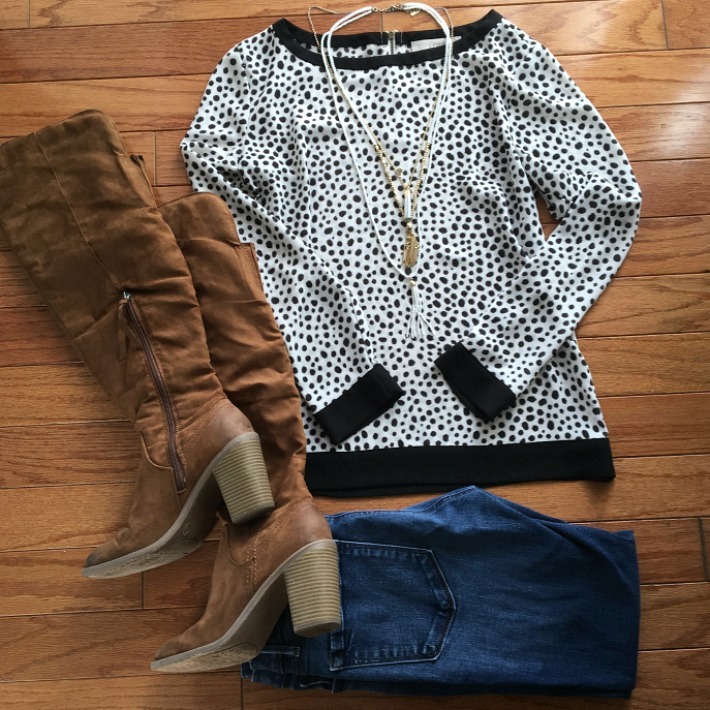 With jeans and this pretty leopard print blouse, this look is ready for an evening out with friends or maybe a date night. Shop your closet tip: for a fun contrast with leather or suede over-the-knee boots, look for blouses in silky fabrics with pretty, feminine details like ruffles or billowy sleeves. This jewel-covered sweater feels like such a party, and in my current mom life with a one and four year old, it doesn't get much wear. It finally gets its time to shine during the holiday season. Over a simple swing dress in burgundy, this look remains comfortable but feels festive. I added polka dot tights for a bit of whimsy (and warmth of course). Shop your closet tip: there are so many embellished pieces out there, I bet you have something that would make an outfit feel more special. A sequin-embellished tee, studded flats, or even a chunky statement necklace would all stand out against a simple dress or jeans and a tee. How do you make your style more festive for the holidays? Check out even more ways I add holiday glam with this post from a few years back. Linking with Oh Hey Girl and On the Daily Style. Don't forget to join Alexandra and me next Wednesday for an Advent Calendar and Holiday Traditions link up. Link up any holiday-related post, either new or from the past.